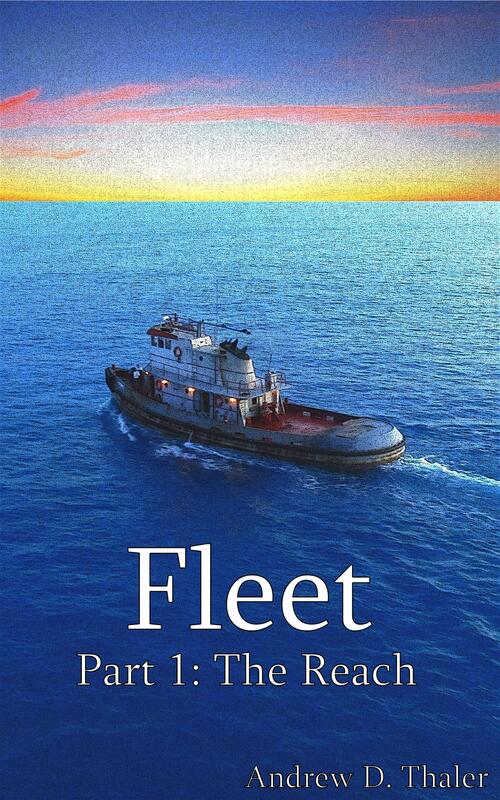 Fleet, my fist foray into book-length, serialized science fiction, is a decidedly salty vision of the near future, where an unknown plague has left land uninhabitable and sea level rise has created vast new oceans to explore. The last survivors of the human race are scattered across new and dangerous seas. The only traces of a previous world are lost among the flotsam. Fleet is an experiment in serial self-publishing. New parts will be released the first Monday of every month through the end of 2013, but Southern Fried Science don’t have to wait a whole month to revisit the fleet. Near the middle of each month, I will post a short mini-chapter for anyone to read and enjoy. While not part of the central story line, these mini-chapters will add details to the world of Fleet and provide glimpses into the lives of minor, yet still important, characters. The first Momentary Distraction, Genesis, tells the story of the fleet’s ancient origin, as remembered by the last survivors of global disaster. Laz and Amberjack were in Rosscarrie’s wheelhouse. Gale and Mackerel departed for Eastward a few minutes ago. “Yeah, I guess so. I never really thought of him as a preacher.” Laz was more interested in spending time at the helm than reminiscing about her long dead father, but Amberjack was curious and she was happy to keep talking with him. “In the beginning, our world was water. Our ancestors lived in the sea. The sea was crowded and filled with demons. They chased us into the shallows where they were too big to swim. After a long time, the shallows began to recede, the sea was sinking! Our ancestors were very clever. They crawled out of the shallows and taught themselves how to walk on land. They taught themselves how to breathe air. They taught themselves how to climb trees. “Our ancestors lived on land for a very long time. They lived there for so many generations that they forgot they had come from the sea. They grew strong and smart. They learned to hunt and gather landfood. They learned to make fire. They learned to build cities. But something was wrong. Our ancestors were incomplete. They had lost the sea so long ago that they had forgotten who they were. “Our friends were growing tired of the land. They started leaving. First the turtles and other giant lizards; then the whales and dolphins walked back into the sea. They could remember where they came from. They all still had the sea in them. We had been on land for so long that we couldn’t remember how to go back. We had lost the sea. “The sea needed us as much as we needed it. The fish were dying, our friends were dying. Without the sea, we were missing something, but without us, the sea was missing something, too. We were incomplete and she was incomplete. We were both dying. “Some very wise men came together, hundreds of years ago, and devised a plan. They had studied our history and understood our technology. They decided that in order to return to the sea, we had to make the shallows rise again. Only then could we crawl back, following the same path we took out. They used their incredible technology to burn the sky! They filled the air with glass to make the world hot. And it worked! The sea began to rise, the shallows, once dry, were again filled with sea. “Our ancestors built ships. Giant ships, big enough to carry an entire city. They floated in the shallows while we waited the many generations it would take to rejoin the sea like our friends. “But land was jealous. Land had seen what our ancestors accomplished when they walked across him. He didn’t want us to leave. So land created the plague, a plague that began in the floating cities. It started with the men. Men would become feverish, they would lose their bowels, and then their flesh would rot off the bone. And it was the strong, healthy men that fell first. Land had created a plague that killed half our fishers, our farmers, our workers, leaving us helpless. The plague spread through our floating cities. As the number of men dwindled, the plague began infecting more and more women. Despite all of their incredible technology, our ancestors could not stop the plague. “The plague spread too fast. Entire cities would fall apart. Without a crew of thousands to keep them afloat, they would rot in the shallows, rusting out and eventually sinking. It became clear that we could not live in such tight quarters. The risk of infection was too great. Some fled to sea in small boats carrying barely more than their families. Others fled to land to try to make peace with the angry soil. “But the soil was tainted by land’s war with the sea. They could not grow foodplants near the shore. In retaliation for the plague, the sea poisoned the dirt so that no foodplants would grow. They tried fleeing further inland, but the further they got from the sea, the sicker they became. The sea had changed the plague, and now it traveled with them. We were being punished for betraying the land and we were being punished for betraying the sea. Amberjack was quiet for a long time, only the sound of Eastward’s horn, announcing his captains return, brought him back to the present. There was silence in the wheelhouse when a flustered and disheveled Gale burst in and announced that they were going back to the fleet. Fleet: The Reach — part 1 of Fleet — is available in the Amazon Kindle store for $0.99. Please take a moment to go check it out (and leave a review if you like it!). Future parts will be publish on the first Monday of every month. Check back here, follow me on twitter, or subscribe to our RSS feed for updates.